It is rarely that things go as planned, but it is always good to have actual plans. I am that kind of person who likes to plan things thoroughly, perhaps too thoroughly and even if I know things are not likely to go the way I planned. I guess it is part of my personality. In this post I thought I would write about what I have planned and what I hope concerning my future university studies. Since I never have been to university, I obviously do not know exactly how things work exactly. And even though things are not likely to go as planned, I thought it would be interesting to look back to this post and compare it to how things actually went when I am about to graduate (in three years I hope). So, I am hoping to start at university this autumn (bachelor's degree obviously). I have applied to study in Denmark and Finland. Denmark is my first option, but just in case I somehow do not get into any of the Danish universities I applied to, I also try to get into some Finnish universities. I am not interested in studying in Finland for two reasons: 1. I want to study in English and I could not find a degree that is thought entirely in English, 2. In Finland there is not the exact study line, that I would like to take. I found few just right ones in Denmark, so I would like to get into one of them. My Danish applications. Try and guess in what field I would like to study, haha. 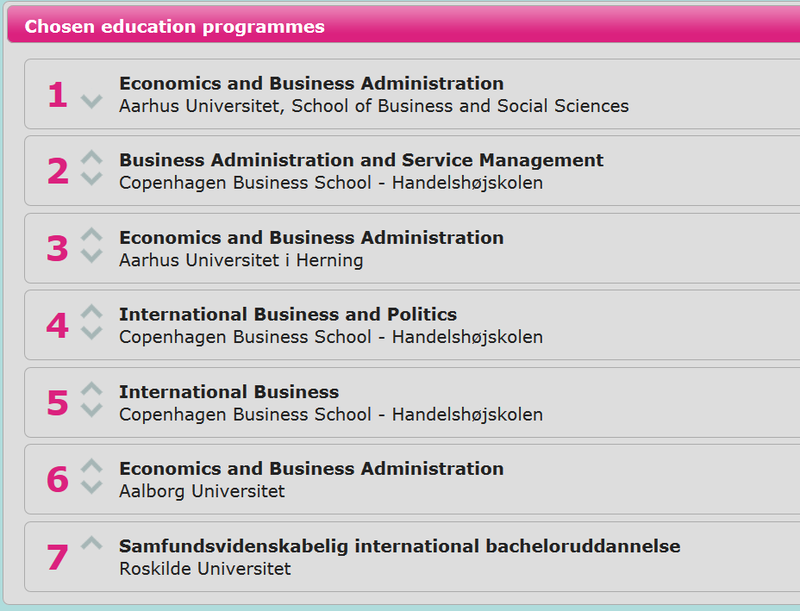 If I actually get a spot in the university I hope (in Denmark), I plan to study the first two years there. Most of Danish universities offer a possibility to go abroad as an exchange student for the autumn semester of the last year. I wish to use this opportunity and go as an exchange student. My first choice would be go to Singapore, but anywhere else in Asia would be amazing too. Then I would go back to Denmark and finish my degree. I do not know as much about Finnish universities. I know that here in Finland universities give more free choices about planning your timetables and study schedule. If I were go to a Finnish university, I would try to speed up my studies by planning my schedules so. It would obviously mean that I would need to work harder, but that is not a problem for me. And I could always slow down if it would get too hard for me. I would try to graduate in two, maybe two and half years. But I still hope it does not come to that since the degrees are not exactly what I hope to study. And my Finnish applications. Same field of study, of course. Since the summer holidays in universities are long, I need something for them too. The first and most optimal option would obviously be to take summer school classes that would help me graduate faster. In Finland this should be possible, but I do not know about Denmark. If it is not possible, then between the first and second years I would like to take some music related course somewhere. I do not expect to get a summer job then yet, but perhaps between my second and third year when I already almost have a degree. I know that in Iceland there is a lack of workers, especially in the summer season, so perhaps there? If the worst comes then I could try to hang around at my relatives' corners (like now) to save in rent. I hope to get my bachelor's degree in the spring of 2018. After that I would like to get a master's degree. I have found just the perfect degree from the Netherlands and I plan to apply there. I also have some decent options in the United Kingdom too. These two countries are my number one options for two reasons: 1. The awesome degree options, 2. It only takes a year to complete the master's degree (in Nordic Europe it takes two years). Number two is especially important since I am already older than the average university student. 1st year: study in Denmark, summer courses* related to music. /study in Finland, summer courses* related to the degree. *The summer job option will be tried too. 2nd year: study in Denmark /study in Finland, summer job (possibly in Iceland). 3rd year: study in Denmark with exchange semester in Singapore (or elsewhere in Asia). /be graduated from a Finnish university and skip to the 4th year. 4th year: master's degree in the Netherlands (or in the UK). I think that sums it up as clearly as it is possible. Of course I have some smaller plans too, but they are not worth a blog post. I know already things will not go this way, but there needs to be some sort of plan what at aim to. It will be interesting to see in a few years time what did come true and what not! I hope I will remember to check back at this post then.